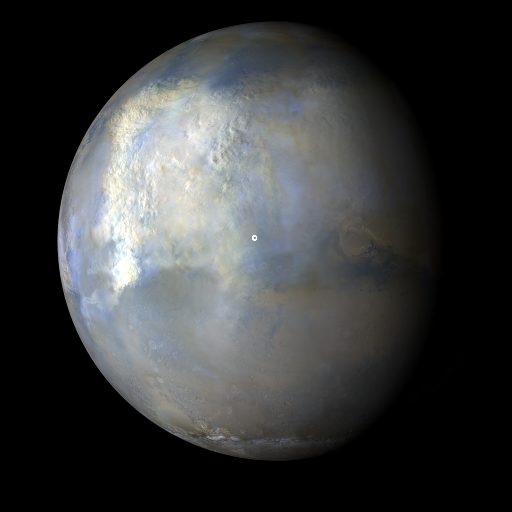 The most prominent weather events last week were two large regional dust storms over the northern hemisphere of Mars. The large arcuate-shaped dust storm, reported the previous week, propagated eastward over the northern mid-latitudes of Utopia Planitia before abating. By midweek, a new dust storm had formed over the Ares III landing site featured in the book, ‘The Martian’. The dust storm moved southward along the Acidalia storm-track into Xanthe Terra. By the end of the week, the storm covered an area from eastern Valles Marineris to north central Arabia Terra, equivalent to the combined area of the entire United States and Mexico. More typical weather features were also spotted over the red planet. A number of local-scale dust storms occurred over northern Amazonis, Argyre, and Noachis Terra. Each afternoon, diffuse water-ice clouds were present over Tyrrhena Terra and the major shield volcanoes of Tharsis. The Opportunity rover in Endeavour Crater encountered exceptionally high dust levels at week’s end due to the large regional activity mentioned above. Meanwhile, the Curiosity rover in Gale Crater experienced storm-free skies each sol. Malin, M. C., B. A. Cantor, A. W. Britton (2018), MRO MARCI Weather Report for the week of 28 May 2018 – 3 June 2018, Malin Space Science Systems Captioned Image Release, MSSS-533, http://www.msss.com/msss_images/2018/06/06/.